I am new to gardening and I have been actually doing really well with the garden up until now. I used organic manure and soil in my raised bed. Everything is level and my garden seems to drain quite well. I did have a little pest problem because I have lettuce and all the rain a few weeks back really made me worry but all that happened was a little white spidery looking growth under the plants in the soil appeared once the first hot day came -which I was told to throw the effected dirt away and pick the lowest leaves- and this has worked. I also sprayed some organic pesticide on my plants about 1.5 weeks ago and the small bite marks in my leaves seemed to have gone away. I live in MA and yesterday night (WEDS.) we had a huge storm. Earlier in the day around 2:30 when the sun isn't directly on my garden I sprayed the organic pesticide on my plants again because I noticed small bite marks returning to my plants and the pesticide container said I may need to do 2 or 3 applications over the next weeks for very persistent pests. About an hour later I watered my plants (this same organic pesticide never made my plants spot with the first application)...then 9:30 comes along and theres a tornado warning and the most intense downpour I have ever seen. Prior to this my plants looked amazing and my pepper plants were growing up so quickly with nice dark green leaves. I come outside on thursday afternoon after work to check on the garden and I find these white/translucent spots ALL OVER ALL of my hot peppers, sweet yellow pepper plants and some random spotting on my lettuce varieties. It almost looked like dirt specs from far away until I got close and realized they were spots. What could this be? I don't think its burning from the pesticide because I didn't do it in direct sunlight but I could be wrong. 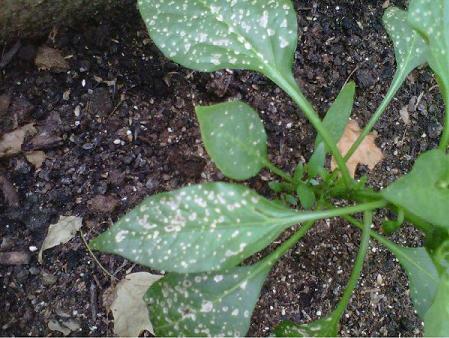 Also, from what I looked up- and I can't find much-I don't know if it could be a nitrogen deficiency from all the rain? The spotting isn't yellow and it doesn't look like typical leaf burn- but I might be wrong. I don't think we had hail that night and the spots aren't holes- but my coworker said it looks like just leaf damage...Do you think they will recover? Please help is this a pest of some sort? I just took care of my slugs problem with a cup of beer and now this! I'm so sad and scared for my plants! PLEASE HELP!!! It looks like the plants have white freckles all over but when you look close the spots are actually translucent and not fully penetrated bite marks- more like the pigment is just missing and the spots are surrounded by white borders. They literally occured over night. Last edited by crysticalll on Fri Jun 03, 2011 1:47 pm, edited 4 times in total. I'm hoping someone with more pepper experience helps out. Did you have an aphid problem? They spread many viruses. White at the base after a rain, sound like it could be Southern Blight? You know I don't think I had an aphid problem...prior to yesterday my plants (mainly lettuce) only had a few little holes eaten away by something but after I used the organic pesticide the first time it stopped. Then I noticed a few more bite marks so I sprayed the insecticide again wednesday afternoon. if it was the insecticide that burned them...why didn't it burn my strawberries and other plants.... same goes for nitrogen burns...why would only the peppers and lettuce be effected? Could it be possible that the rain did this to my plants or is it more likely to be some disease that occured quickly over 12 hours or so...not even that much time? Looks like spray burn to me. I've had it happen before when I thought that I did everything right. What is the inert ingredient (carrier liquid) in your pesticide? It doesn't look like any common disease or insect damage. Always look for the culprit before spraying so you know what you're trying to kill. Worms will be somewhere on the plant. Flea beetles will be there until they hop off when you get close. Aphids stay where they are. Holes in leaves without anything around are often from slugs-snails. slugs-snails often need a different pesticide. Ohhh, I used the SAME product on my cucumbers and got the SAME result! Wasn't positive the EcoSmart was the culprit but I guess that settles it. It must be burning the leaves. The good news is while the leaves themselves won't recover, the damage hasn't stopped my plants from producing tons of new leaves, flowers, and cukes. But let's you and I BOTH quit using that insect killer! !